The Sinn EZM 3 on bracelet is the last of the original Sinn EZM series of watches, designed for extreme conditions (the Sinn EZM 1, EZM 2 and EZM 4 models have all been retired). The inert gas filled watch cavity and dehumidifier capsule prevent fogging by guarding against moisture intrusion, and special micro-lubricating techniques allows for operation down to -45 degrees Centigrade. Verified Owner Comments: The most compact and comfortable 500 meter dive watch ever. The EZM line is a breeze to read. 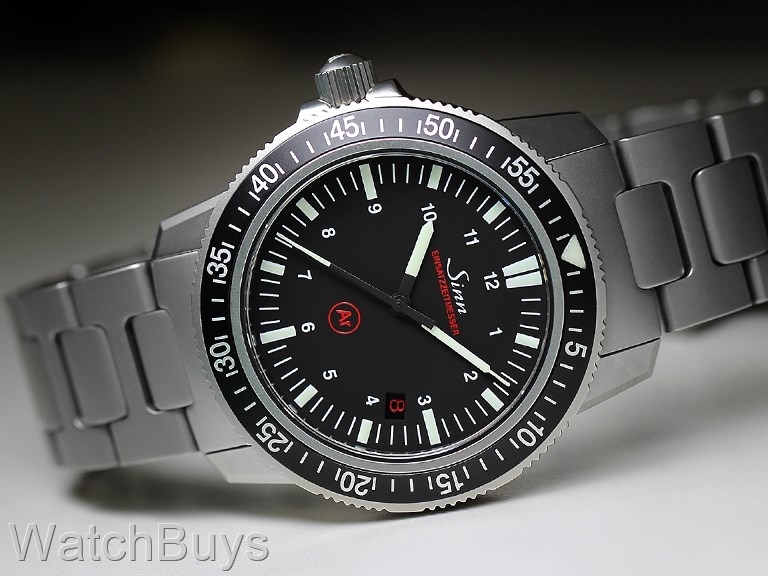 It possesses most of the technical features that Sinn has pioneered. Mine is the bracelet model but for everyday I wear it on strap. I believe it has the highest anti-magnetic rating of any of their watches. I also has the widest temperature operating range as well. Sinn only uses the highest grade movements. It wears quite well on my 7.25 wrist. The left hand crown is certainly the way to go from a comfort perspective. On a separate note, I have attended the Watchbuys NY Road Show and met with some of their representatives personally. They are a top notch crew and look forward to a lasting relationship with them. Sinn watches are a remarkable value. If you're sitting on the fence... go ahead and pull trigger. You won't regret it. Verified Owner Comments: I've had my EZM3 for two weeks now and I absolutely loved it. Just can't take it off my wrist! The dial, case and the bracelet are all very high quality, and together make a nice tool watch. Also, nice service from WatchBuys as always! Verified Owner Comments: Every watch has to have something, this has many. Anti-Magnetic protection like the Rolex Miligauss, 500m Depth certified, Ar gas/Copper Sulfate capsule/EDR seals, special temp proof oils, left hand offset crown, and ar coating on both sides of the sapphire crystal. It's the second highest level of ETA 2824-2 calibre (TOP), has a great bead blasted finish and subdued dial. I wear this more than my Rolex Seadweller or my Omega Seamaster because it's just more interesting. It's also inconspicuous as virtually no one but watch nerds will know what a Sinn is. No regrets. Verified Owner Comments: Honestly, I'm not blown away by the watch. The watch is pretty plain jane, and the red date window is impossible to see under almost any condition. Watchbuys was a great experience and I wouldn't hesitate buying from them again. "The Sinn EZM-3 is a Great watch!" Verified Owner Comments: I've really enjoyed my new Sinn EZM-3. I've worn it every day for about 3 weeks now. The bead-blasted finish is very attractive and works well with my suit-and-tie daily work attire. The watch face is very clean and easy to ready with a quick glance. Verified Owner Comments: This was my second Sinn but my first purchased new and my first experience with WatchBuys. I can honestly say that both aspects were an excellent experience. Starting with the excellent customer service and finishing with receiving my EZM 3 the watch is a masterpiece. The blasted finish is flawless and it's keeping perfect time. This is a seriously impressive timepiece and well worth the money. Verified Owner Comments: This is my favorite Sinn. Just like any Sinn watch, the build quality is excellent. Perfect dimensions. Thin enough to slide under a shirt cuff. Versatile, able to dress up or down. Amazing technology! It's just an all around great watch. The bracelet fits very nice and is easy to size with the included tool. Customer service, as always, was superb. Verified Owner Comments: I have to say that when I received my EZM3 I was blown away. It wears larger than it's 40mm size would suggest. Fit and finish are typical Sinn that is to say excellent. Great Watchbuys service to boot. A can't miss in my opinion. Verified Owner Comments: I Like the watch a lot. But the red date is hard to read. I am used to wearing 42-44 mm watches and I was worried about the 40mm case. It wears big and I love feel of it. I can say it has been a long time that I could wear a watch all day and forget I have one on. The weight for me is perfect. Verified Owner Comments: A watch made for the German Border Forces was a fitting choice for my own profession here in America. My proclivity for this watch over other divers was its reasonable size of 40 mm. The EZM 3 is appropriate for any setting from formal business meetings to guarding the border. As others have stated, the only feature for which this watch can be criticized is its date wheel. The selected color is difficult to read when ambient light is moderate to low luminosity. Sinn designed this watch for nonessential information to disappear during operations. Unfortunately, this feature works all too well. Verified Owner Comments: Very high quality, perfectly sized watch. Much more wrist presence than I thought it would have. Very rich looking and combination of anti-reflective crystal and bezel is very handsome. Mine keeps great time. A little weird getting used to the reverse crown location but it was intended as a functional dive watch. Negatives? Lume doesn't last long and the date is almost impossible to read (red like the Argon label). You can wear this as a casual watch but it looks fine with a suit. Versatile and classy. I get lots of compliments. Bead blasted finish extremely scratch resistant, perfectly legible dial, and a great size. Verified Owner Comments: Solid, elegant, keeps excellent time ... looks amazing on Sinn rubber strap. "EZM3 quietly annihilates the competition with superior build, function, durability, aesthetics and exclusivity"
Verified Owner Comments: Kudos to Sinn for maintaining a course of innovation and design. The EZM3 is the quintessential tool watch yet it can transition effortlessly to the finest suit and feel right at home. The EZM3 will keep subs in hiding under their owners sleeves. Verified Owner Comments: Perfect size. tough and VERY legible. Verified Owner Comments: This watch is just what I was looking for and much more. The technology packed into this compact functional package is impressive. It is my "do it all" watch and it does it all as advertized. Easily my most useful, most worn watch. Verified Owner Comments: A very good investment and a great watch to wear daily. "The best of the Sinn line"
Verified Owner Comments: Admittedly I am biased, but this is among the most attractive tool watches there is and a "good value" compared to an EZM1 (used), Rolex Sub or other higher end watch. I really like the brushed dial. It actually stands out is a sea of polished metal bracelets!